The facilities and resources available to our research group are established to successfully complete exercise and nutrition based protocols and perform biochemical and molecular biological research. In addition to our own facilities within the Department of Kinesiology and Community Health, we have access to core facilities, which provides state-of-the-art research infrastructure to University of Illinois researchers. Also, the Center of Health, Aging, and Disease (CHAD) provides biostatistical support and conference/videoconference facilities to researchers in the Department. Please see below for specific detail related to various aspects of our research infrastructure. The exercise intervention space is shared amongst the T.K. Cureton Physical Fitness Research Lab members and includes Woodway motorized treadmills, cycle ergometers, Lode Excalibur Sport Cycle, Ergometer Biodex Isokinetic Dynamometer, 4 ParvoMedics TrueOne Metabolic systems, and resistance exercise equipment. The clinical intervention spaces are shared amongst the T.K. Cureton Physical Fitness Research Lab members and includes 2 YSI glucose-lactate analyzers, Harvard infusion pumps, Bergstrom biopsy needles, IV stands, crash cart, 3 adjustable hospital beds. Located adjacent to both biospecimen collection spaces is the dual-energy X-ray absorptiometry (DEXA) for the measurement of bone mineral density and body composition. The Muscle Metabolism Laboratory is directly overseen by the Nutrition and Exercise Performance Group. 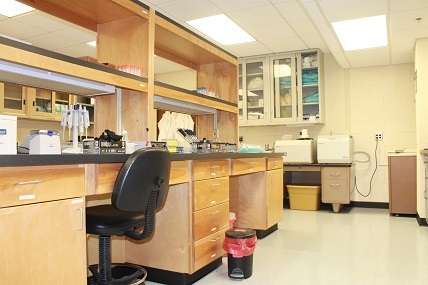 This space is BSL2 approved and contains ample laboratory benches and the necessary equipment (such as centrifuges, western blotting equipment, speedvac concentrator and vapor trap, laminar flow hood, freeze dryers, -20 deg C freezer, and laboratory oven), and other miscellaneous items (pipets, vortexes, heating blocks, etc) for analyzing blood and muscle tissue. The Food Preparation Lab is shared amongst the T.K. Cureton Physical Fitness Lab members and includes cookware, blenders, food scales, and other various kitchen tools. There is also cabinets for dry food storage and refrigerators for food storage. The freezer room is shared among the T.K. 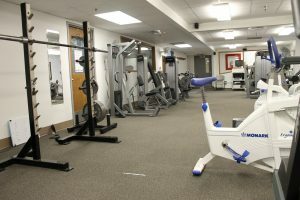 Cureton Physical Fitness Lab members and includes ice machines and multiple -80 deg C freezers for the storage of human muscle and blood samples. In addition, we have established the Human Biobank which contains blood and skeletal muscle biopsies collected from a wide range of human volunteers reserved for future analysis. This core facility is located less than 0.5 m from our research lab. The facility contains the necessary equipment to prepare samples and perform subsequent isotopic enrichment analysis in human samples such as: Agilent 6890N GC/5973 MS (GC/MS), Agilent 7890A GC/5975C MS (GC/MS), Applied Biosystems 5500 QTrap with Agilent 1200 LC (LC/MS). Experienced technicians are available for technical assistance and quality control with all equipment in core facilities, and access to analysis software is provided. This core facility is located less than 0.5 m from our research lab. The facility contains the necessary equipment to perform protein/peptide identification by proteolysis coupled with mass spectrometry and database searching. There is a choice of using either MALDI-ToF (Matrix Assisted Laser Desorption Ionization – Time of Flight) or ESI-QTof (Electrospray ionization – Quad Time of Flight) with LC (Liquid Chromatography). Experienced technicians are available for technical assistance and quality control with all equipment in core facilities, and access to analysis software is provided. This core facility is located less than 0.5 m from our research lab. The facility provides the necessary bioinformatics services to assist with high throughput genomic, proteomic, and other ‘omic’ analysis to help gain insights into biological processes in response to nutrition/exercise. The University of Illinois operates a fully functional, federally inspected abattoir that allows for the harvest and processing of cattle, sheep and swine. The facility includes all equipment needed to harvest animals, store and age carcasses, and process carcasses into commercial or research required cuts. Further processing of both fresh and processed meats is performed. Grinders and patty makers are available to manipulate food textures. The laboratory also includes necessary equipment to determine the proximate composition of meats, foods and tissues.